Laksa Media Groups Inc., 9780993969607, 368pp. There's a delicate balance between mental health and mental illness . . .
Nineteen science fiction and fantasy authors tackle the division between mental health and mental illness; how the interplay between our minds' quirks and the diverse societies and cultures we live in can set us apart, or must be concealed, or become unlikely strengths. We find troubles with Irish fay, a North Korean cosmonaut's fear of flying, an aging maid dealing with politics of revenge, a mute boy and an army of darkness, a sister reaching out at the edge of a black hole, the dog and the sleepwalker, and many more. AUTHORS: Kelley Armstrong, Suzanne Church, A.M. Dellamonica, Gemma Files, James Alan Gardner, Bev Geddes, Erika Holt, Tyler Keevil, Rich Larson, Derwin Mak, Mahtab Narsimhan, Sherry Peters, Ursula Pflug, Robert Runt , Lorina Stephens, Amanda Sun, Hayden Trenholm, Edward Willett, A.C. Wise. "Strangers Among Us . . . is important, shining a much-needed spotlight on issues that get far too little attention. A wonderful anthology, one of the major SF&F books of the year. Bravo "
"The writing is excellent throughout, and even the few not-as-strong stories make for a good read. This is a unique collection that should attract readers of all genres. 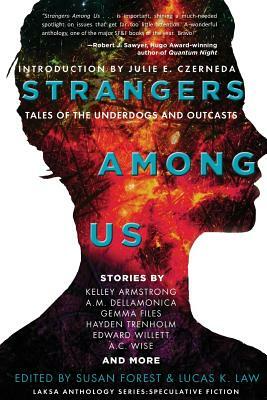 "The stories in Strangers Among Us are as varied in tone and approach as their authors. The power of the collection derives from this variety; while each story can be read in isolation, the assemblage of outsiders feels, on a whole, exultant. There is, indeed, strength in numbers, when each individual is accorded space and respect." "VERDICT: Mental illness is an exciting theme for an anthology, leaving plenty of room for variety"
The anthology is recommended in Kirkus Reviews as one of "The August 2016 Science Fiction and Fantasy Books You'll Want to Read." "Though this book has some shortcomings, readers who have mental illnesses may find themselves somewhere in these pages and as a result may no longer feel so alone or isolated."